Eldridge Plays and Musicals. 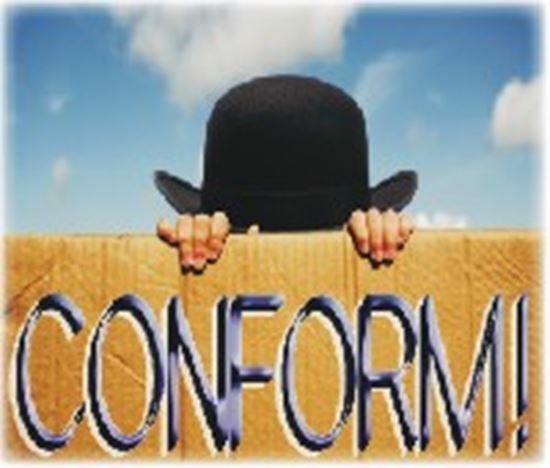 Conform! "Conform!" is an absurdist farce which takes place in a park where three men in boxes comment on humanity and the passersby who frequent their territory. They urge one and all to conform to the constraints of society, but in the end it is they who must practice what they preach. Through the use of stereotype, cliché and controversial comments, the characters humorously expose their flaws and allow the audience to laugh at some of their own shortcomings. One of three plays highlighted at the Florida State Thespian Conference in 2007 where one judge described it as "Beckett meets Python." About 30 minutes. A.: Of all the plays I have written CONFORM! was the most spontaneous writing experience. The characters virtually sprang full-grown from my head, and I basically followed and recorded their antics. Q.: WHERE DID THE CHARACTERS COME FROM? ARE THEY BASED ON PEOPLE YOU KNOW? A.: While I believe all characters are modeled, either consciously or not, after people we know, the CONFORM! cast of characters hopefully don't mirror any of my friends or family! A.: One moment in the play I enjoy is when the three gentlemen take a moment, slow things down and reflect - on the enormity of their lives and the shapes of clouds. A.: It was my intention to produce a piece of work that would allow the actors to have some fun and.play.